Red wines from the mountain AVAs of Napa are grand wines for the holiday season. Lokoya vines on Mount Veeder. Photo by Hayley Hamilton Cogill. Holiday season is in full swing. I’ve chosen of few of my favorites from the mountain regions of Napa Valley with volcanic rock-filled terrains. The vines are stressed vines, a good thing for wine, and they produce structured, concentrated fruit with firm tannins, intense minerality, and layers of earthy herbal and black fruit flavors that are truly delicious. Here are a few to consider for your holiday pairings, a few sent for editorial consideration. I was recently introduced to Acumen, a new winery from high atop Atlas Peak led by one of Napa’s most respected winemakers, Steve Matthiasson. Originally started by the Acumen team of winemaker Denis Malbec and viticulturists Garrett Buckland and Mattiasson, the trio was drawn to rugged Atlas Peak, purchasing two sites, farming 116 acres of organic vineyards. Sadly, Malbec passed away in a tragic accident this year. Mattiasson stepped in as the full-time winemaker without relinquishing his work at Matthiasson Wines. The 2012 Food & Wine “Winemaker of the Year” is a farmer at heart. His resume includes Araujo Estate, Dalla Valle, Spottswoode, Duckhorn, and Hall. His goal at Acumen is to showcase the earthiness and structure of the high-elevation wines and highlight the density and strength volcanic soils give the fruit. 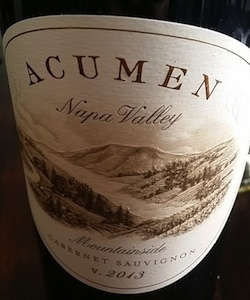 Acumen Mountainside Cabernet Sauvignon melds ripe and dried fruit with woody herbs, crushed stone, and dried tobacco. $60. 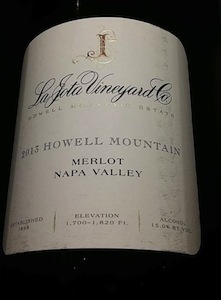 High atop Howell Mountain, one of the most northern mountain regions of Napa Valley and away from the Bay and coastal influences, the wines are heady, masculine and delicious. Daytime temperatures on are cooler than other parts of Napa Valley, but at night it is warmer. The region also sits above the fog line which keeps the cooling effect away from the fruit. These conditions are perfect for growing grapes that are tightly clustered and concentrated and produce intense fruit flavors in the wines. 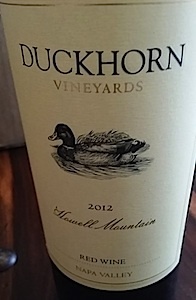 Duckhorn Howell Mountain Cabernet Sauvignon captures the well-structured earthiness of the mountain with a powerful wine that also has freshness from balanced acidity in the fruit. $95. 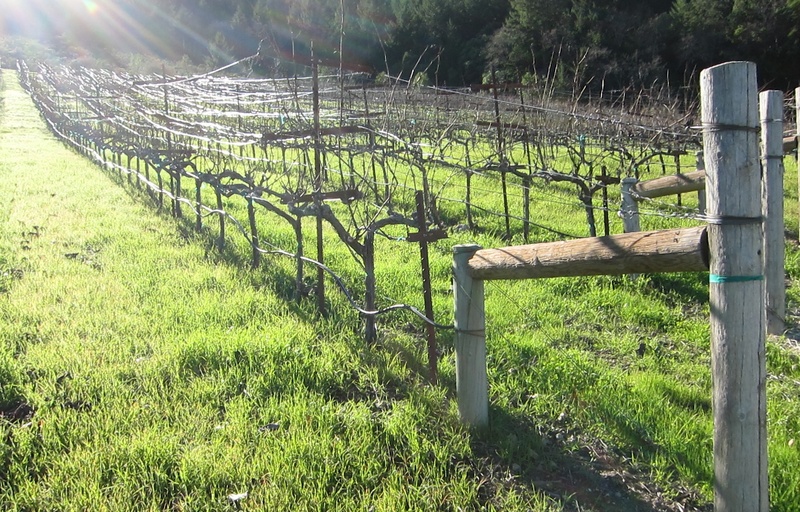 La Jota Vineyard, also on Howell Mountain, was planted in the late 1800s. The wines from the site began winning medals as early as 1900. Today, Jackson Family Wines cares for this historic site. Winemaker Chris Carpenter produces wines for their incredible single-vineyard Lokoya Wines and mountain blend, Cardinale, as well as La Jota. If you are trying to convince a Cabernet drinker to try Merlot, look no further than La Jota Merlot, as this well-integrated wine layers black plum with espresso, chocolate and pencil shavings. $85. Though Cab is king in Napa, Black Sears Winery high atop Howell Mountain has proven that Zinfandel in this area deserves just as much respect. For over 30 years, the organic and biodynamically farmed Black Sears vineyard has supplied grapes for some of the finest single-vineyard wines in Napa, including wines for Turley and Schrader. Their Cabernet is dense, gritty, and expressive, and their Zinfandel shines as some of the best wine produced on the mountain. Bold, full-bodied, peppery, and earthy, the rustic expression of the variety comes through in the exceptional wines of Black Sears. Available via their website, through allocation. 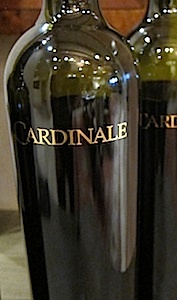 Winemaker Chris Carpenter captures the essence of Napa Valley mountain fruit with Cardinale. Carpenter blends grapes from Napa’s mountain regions and showcases the volcanic, mineral-intense soils of each AVA. The result is a wine filled with character, integrated tannins, earthiness, and luscious fruit. $250. The historic Brandlin Vineyards Estate on Mount Veeder has a small, quite special Zinfandel vineyard dating back over 100 years. Though the winery focuses more on stand-out Cabernet for their proprietary Brandlin Henry’s Keep Red, their small production, Brandlin Zinfandel, is jammy, fruit-forward, and spicy with juicy lushness and a full-bodied profile. A great wine for anything barbecued. $40. 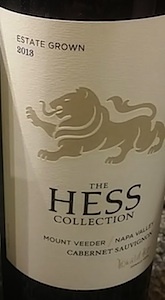 Also from Mount Veeder, Hess Collection crafts their black and blue fruit filled Mount Veeder Cabernet Sauvignon by blending a touch of Malbec with the Cabernet. Coffee and mocha meld with ripe berry, crushed stone, and toasted oak. $65 at Spec’s. What is Your House Wine?